PSG suffered a heavy 5-1 defeat to Lille on Sunday, and it’s fair to say that the players and staff weren’t impressed with referee Benoit Bastian. The French giants are closing in another Ligue 1 title this season, as they boast a 17-point lead over their nearest rivals with only a handful of games remaining. However, their title celebrations were postponed on Sunday after they suffered an embarrassing 5-1 loss to Lille, their heaviest defeat in 10 years, with Juan Bernat being sent off in the first half while Kylian Mbappe had two goals ruled out for offside. 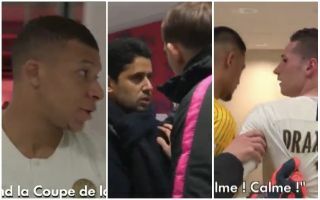 Naturally, with those decisions going against them, tension was high as they made their way down the tunnel and as seen in the video below, coach Thomas Tuchel, Mbappe, Julian Draxler and club President Nasser Al Khelaifi all expressed their displeasure towards the officials. Addressing the officials in this way is surely going to land PSG in hot water with the French FA who will have to take a closer look at the footage, although the capital club will have another chance to wrap up the league title when they face Nantes on Wednesday night.